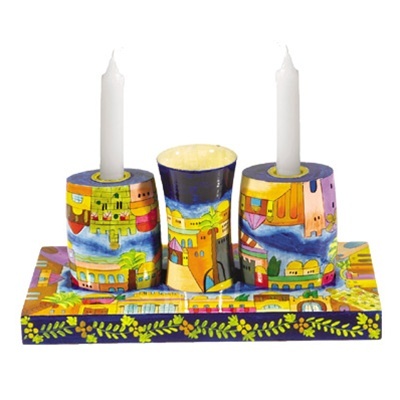 Begin and end your Shabbat with this beautiful set that has everything you need for candle lighting, Kiddush, and Havdalah! 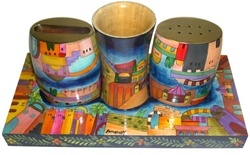 These beautiful pieces of art give a welcome burst of life and color to escorting the Shabbat Queen into the home as well as to bringing in the new week. Each set comes fully equipped with three wood pieces on a rectangular painted stand. At the beginning of Shabbat they act as candle sticks and a Kiddush cup and at the end of Shabbat you can flip the candles over and find a spice box and candle holder! The ability to open and close your Shabbat with the same set is sure to give more meaning and depth to the ritual. The set features a beautiful scene of the old city of Jerusalem. All of the pieces in the set are made of wood, painted in gorgeous vivid colors, and then lacquered to seal the paint and make the set completely waterproof.